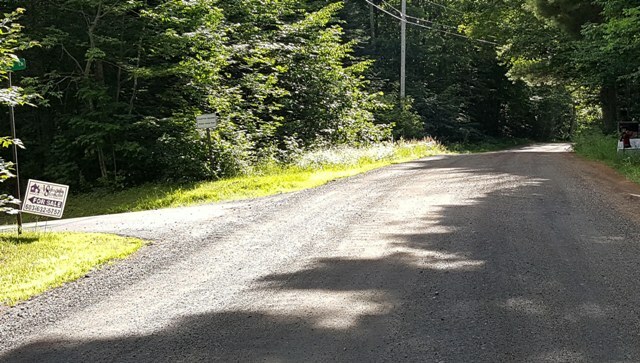 Effective Monday February 25, 2019; all Town Roads in the Town of Canaan will be posted temporarily prohibiting all vehicles weighing in excess of (6) six tons from traveling on these roads until further notice. Pursuant to RSA 231:191 any person who violates the maximum weight limits shall be required to restore the highway if the Town has reason to believe that the highway damage or disturbance is attributable to vehicles or activities under such person’s control or responsibility. 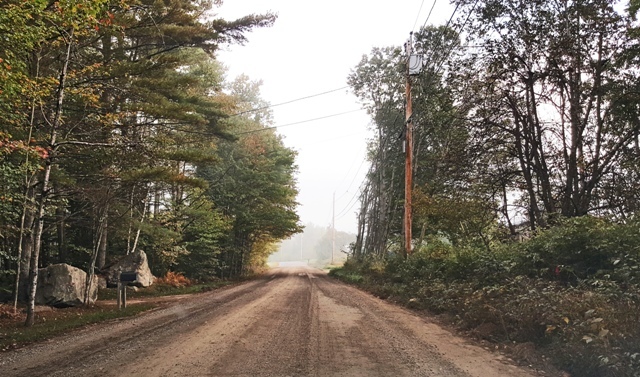 As per RSA 231:191, Paragraph III, written permission to drive a vehicle on Town roads may be granted subject to imposition of reasonable regulations such as bonding and restoring the highway, or other limitations. Such permission may be granted on a case-by-case basis by the Road Agent, depending upon such factors as weather and road conditions. 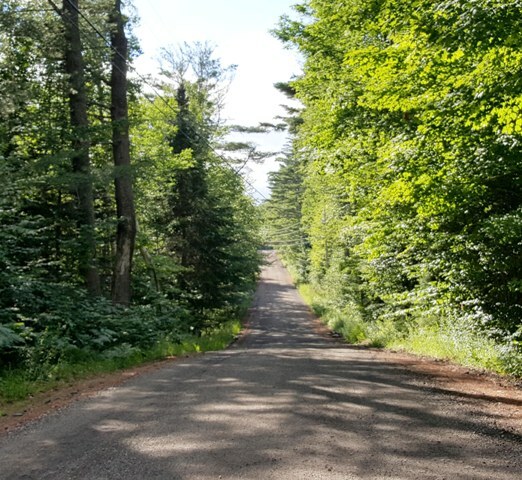 The weight limit will be lifted as soon as the roads sufficiently dry in the springtime to allow normal traffic without causing pavement and shoulder breakup. Town of Canaan - Call 523-4344 for more information. 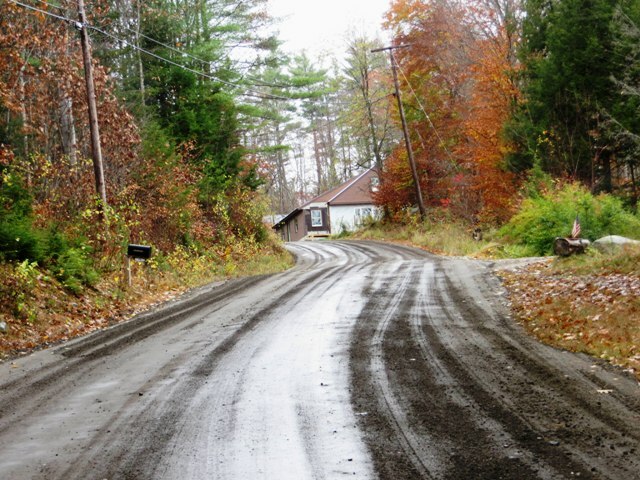 Beginning in 2012, the Town will annually invest money in rebuilding the bases of dirt road. 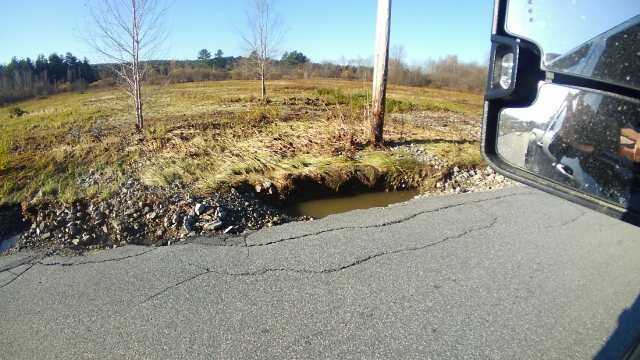 The worst drainage areas of our dirt roads are being targeted for rebuilding. Funding only allows for rebuilding of a small part of the worst sections each year. The key is to continue this process each year over the next twenty years. 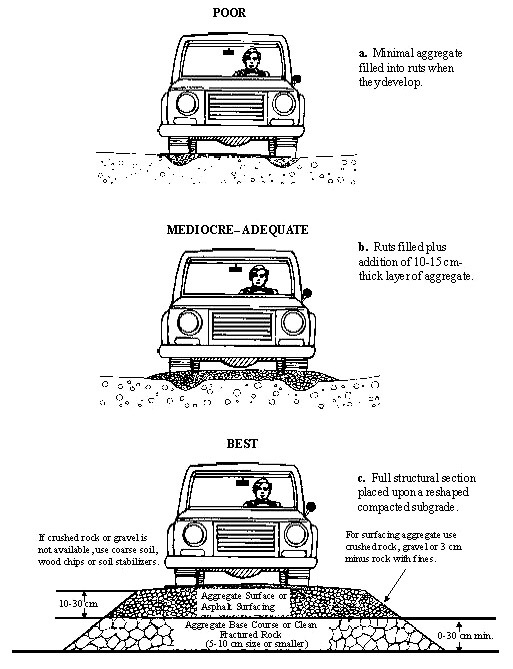 The process will remove the existing road by a depth of from 2 to 4 feet. 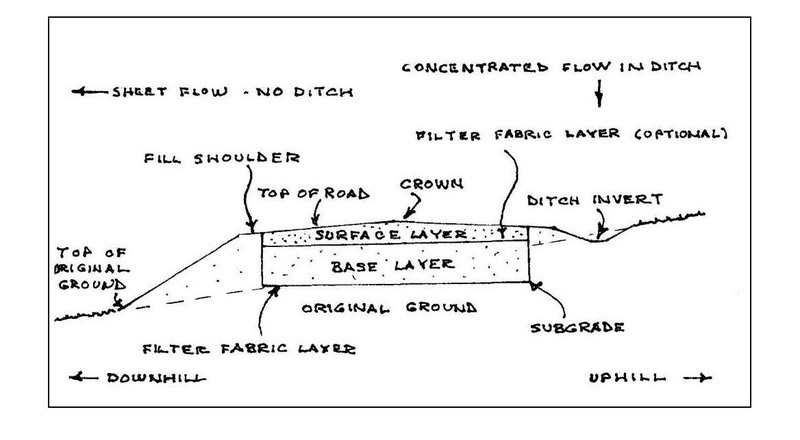 The next step will be to assure that the ditches have adequate depth and will drain water away from the road. 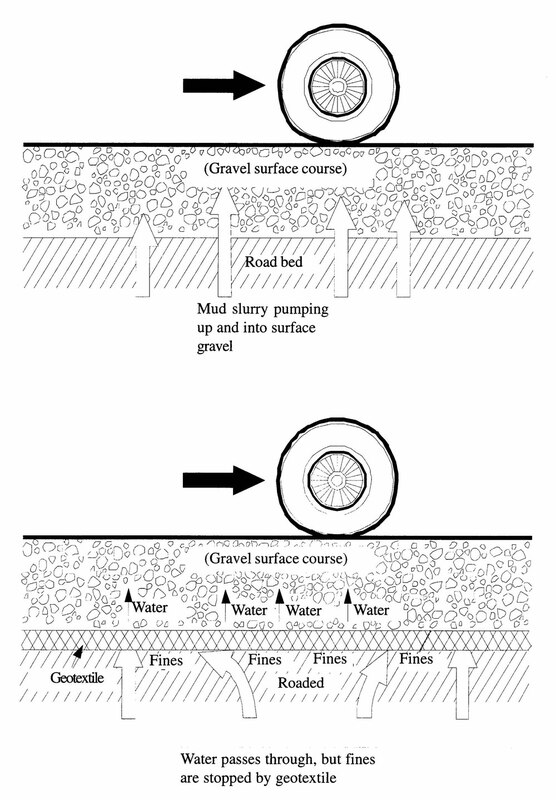 The Department will put in a drainage layer of stone above a membrane to keep the upper driving layers dryer. Those drive layers of gravel are the final step. 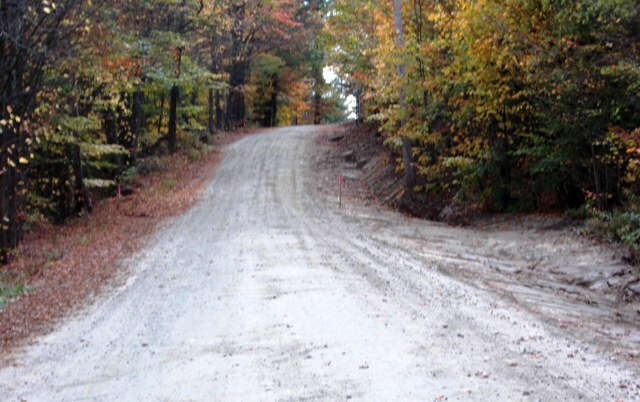 The goal is to redo between a half mile and a mile of dirt road a year. 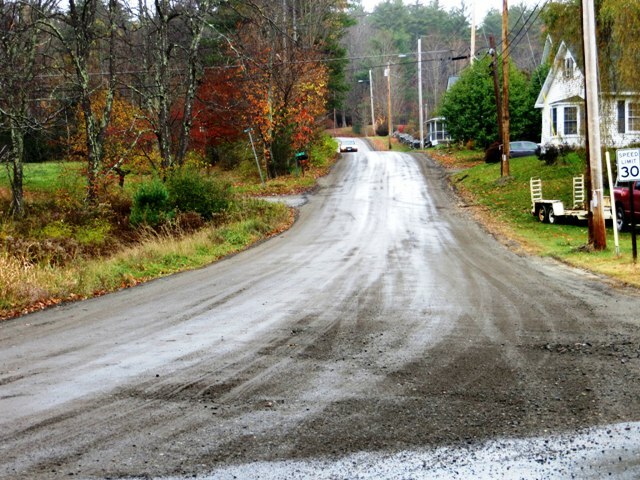 The Town has 70 miles of dirt road with about a third needing major repair. 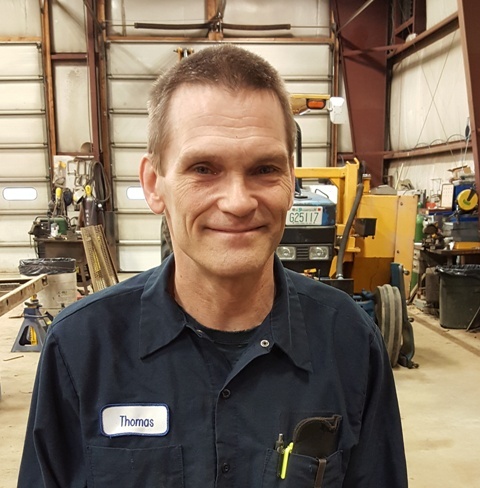 On May 1, 2017 Thomas Marlar, a resident of Canaan, accepted the position of Town Mechanic. We have been extremely fortunate to hire him. 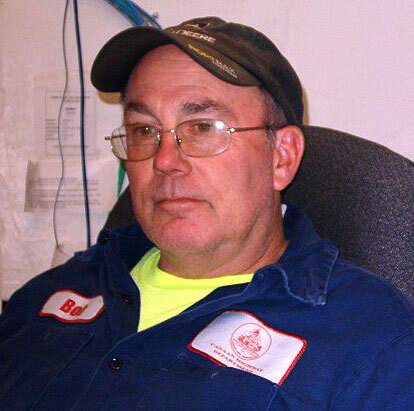 He has great references from RSD NationalLease in White River where he has been a mechanic for 22 years. Due to restructuring at RSD, Thomas was interested in the position close to his home. Prior to working in the Upper Valley, he served as a mechanic in the Marine Corps where he received recognition for maintenance of equipment during a Gulf War campaign. Tom has done a tremendous job completing repairs of equipment. During 2017, he was responsible for saving the Town $41,000. Much of the savings came from Tom performing major repairs in-house. His efforts only required the purchase the parts rather than paying for parts and labor. 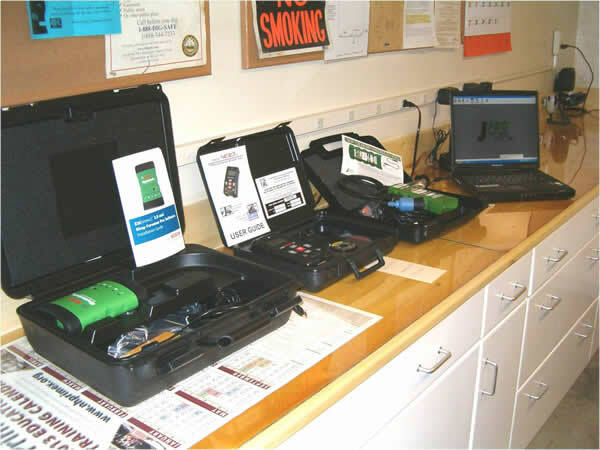 He has also strengthened the preventive maintenance program to reduce equipment break-downs. 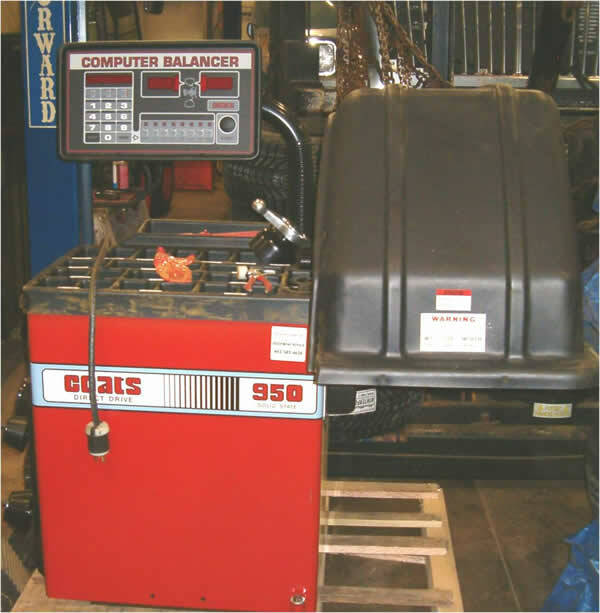 The town mechanic is trained in the use of of computer diagnostics, and equipment was purchased in 2012 to increase the cost savings and efficiency for the Highway Department. 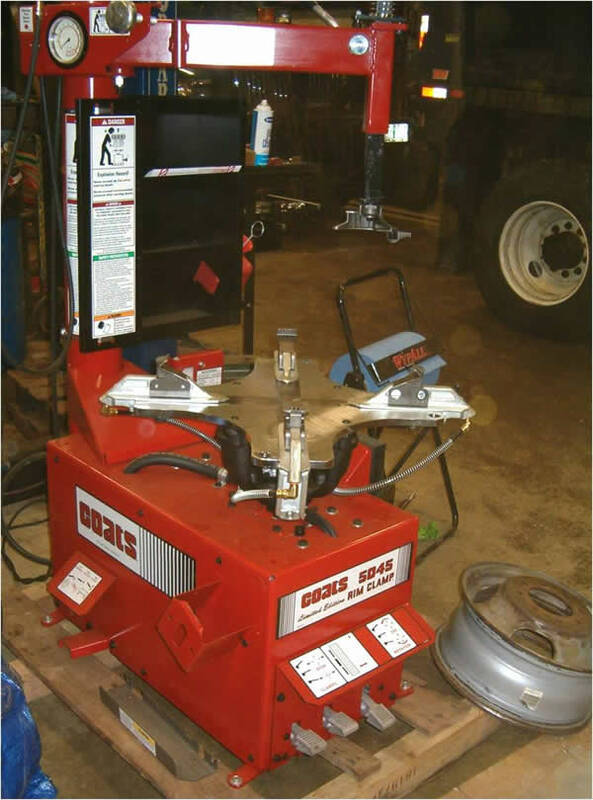 In addition, tire balancing equipment was also purchased, reducing the costs of subcontracting these jobs out. 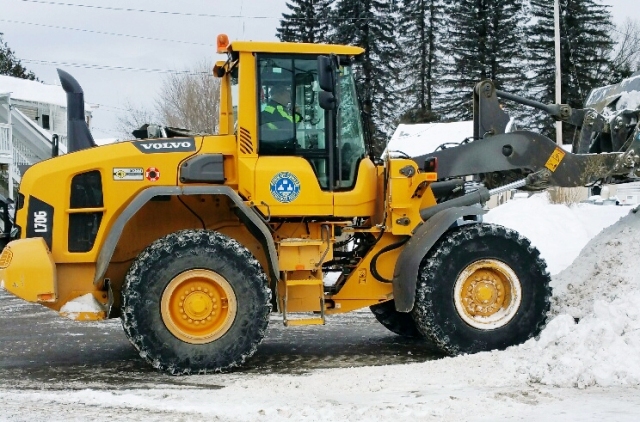 In 2014, a 1986 Military Surplus Vehicle that had been used extensively over the years by the town as a plow vehicle, a tow vehicle for the road rake, an emergency response vehicle, a tree cutting crew response vehicle, and for other similar uses was restored. The Blazer had fallen into disrepair, and purchasing even a used vehicle of similar style would cost at least $15,000. The town could not afford this. 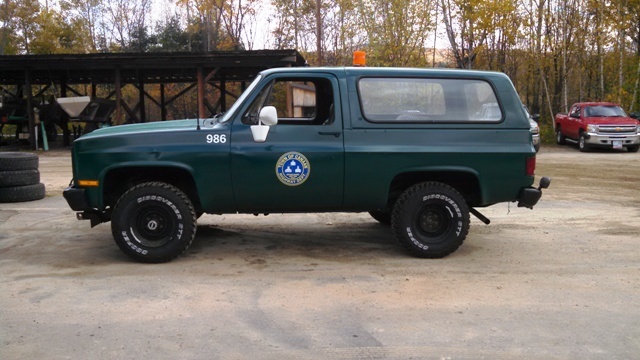 At significant savings, the town mechanic removed and replaced the rusted equipment including the battery rack, fenders, wheelwells, and tailgate, and provided a new paint job. This should enable the Blazer to service the town for many more years. Stevens Road was the main project in 2018. 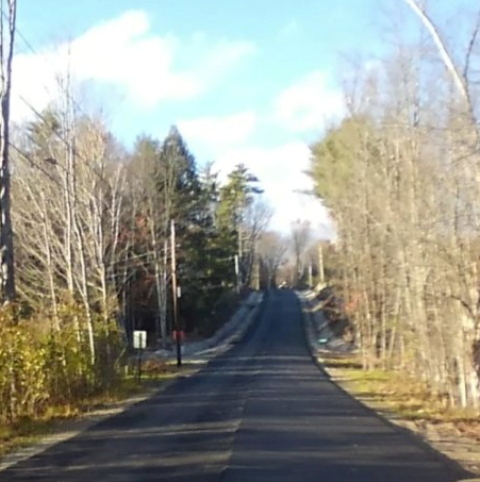 The road was rebuilt, two retaining walls were built to widen the road, and paving was done from 118 to North Lary Road. In addition, the Senior Center parking lot was paved. 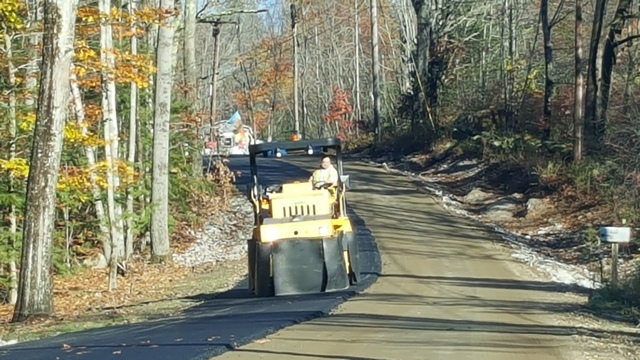 The goals for 2017 were to grind the old asphalt on three sections of West Farms Road and repave all of the paved portion. 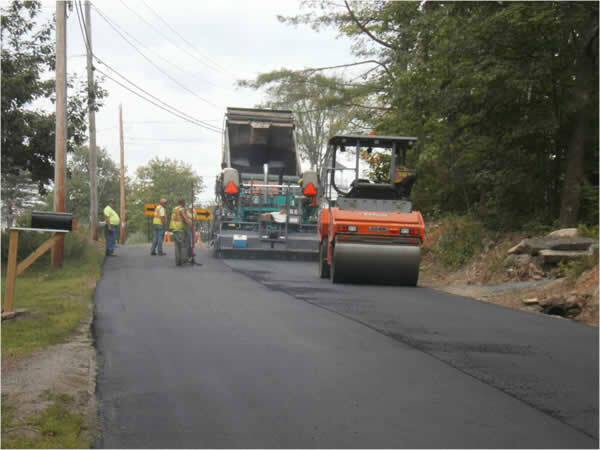 On Stevens Road, grind all of the asphalt and regrade and let the road compact and repave it in 2018. 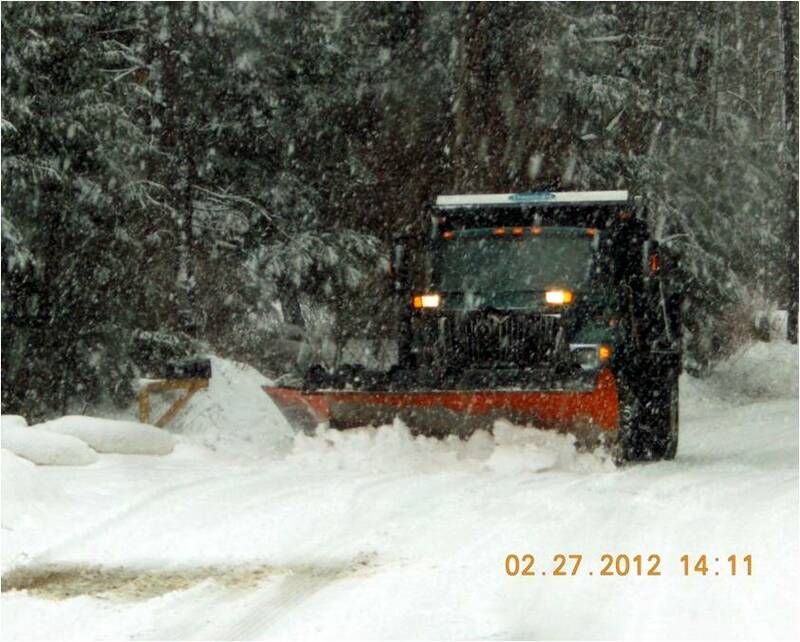 Continue culvert, ditching and tree work on roads in general as needed. The State of NH gave Canaan a one time grant of $138,000. 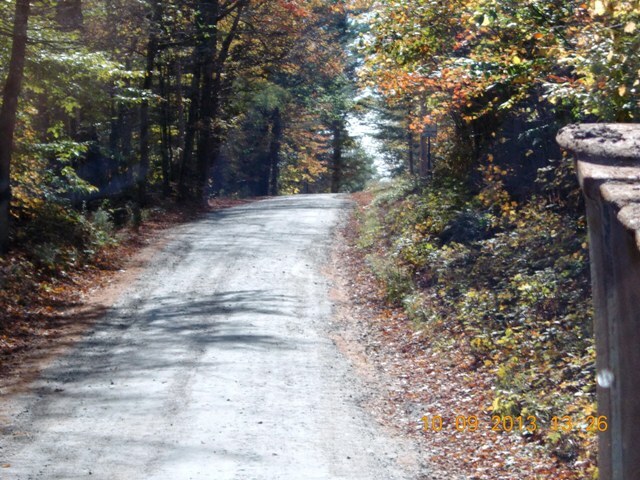 Part of that grant allowed us to grind and repave Jones Hill Rd in addition to the planned work. 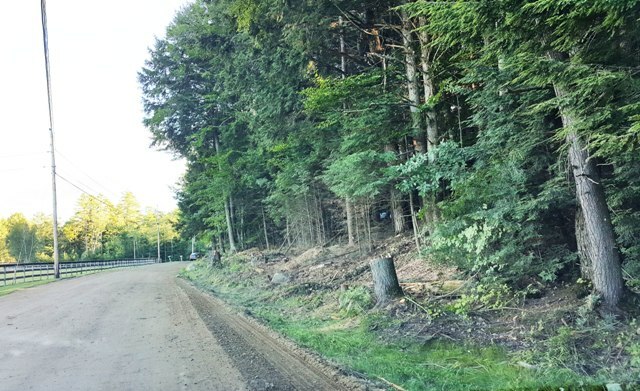 An uplanned 2017 project was the repair of 12 roads damaged by heavy summer rains and flooding on July 1, 2017. 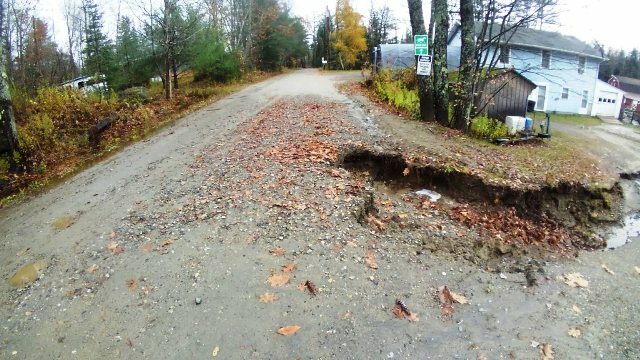 The Town has applied to FEMA for a grant to pay for repairs. 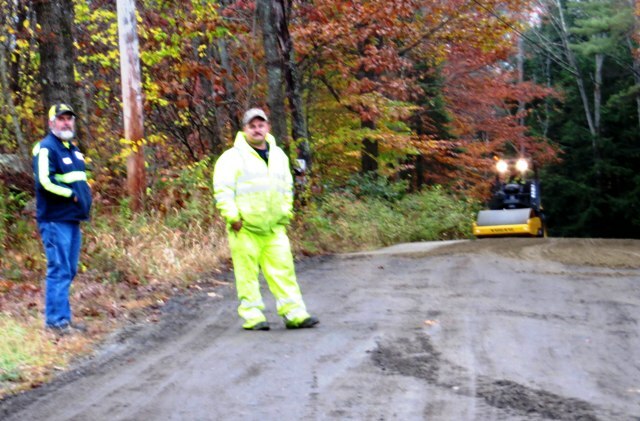 A second major flood event in October also necessitated repairs to paving, culverts, and bridges. 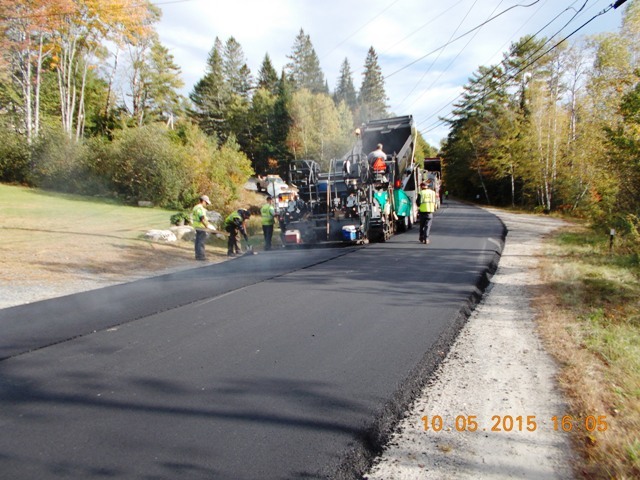 The major road project for 2016 has been Talbert Hill road reconstruction. 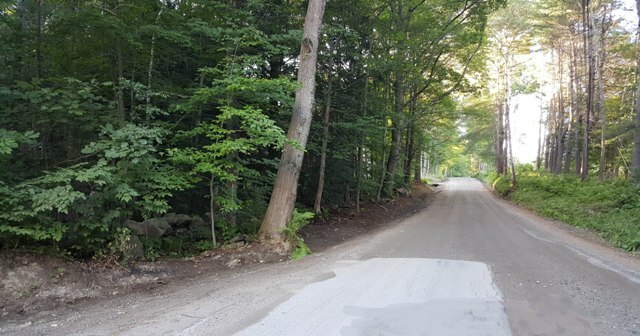 The normal work of cleaning culverts, ditching, replacing culverts on West Farms Road, grading and applying calcium for dust control was undertaken. 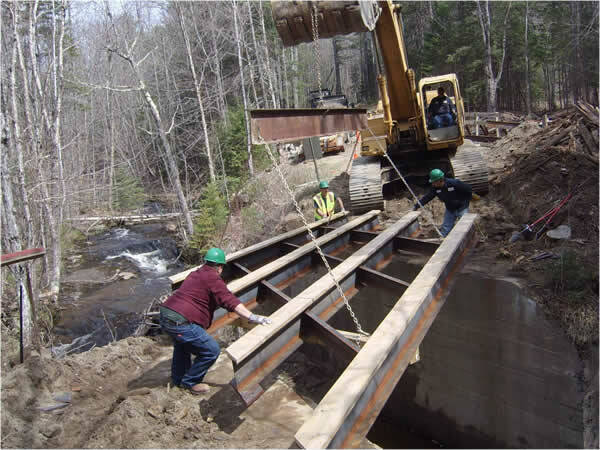 In addition, the abutment for the North Lary Road bridge was repaired where it was being undermined by storm water run-off. Other community projects were undertaken as well. 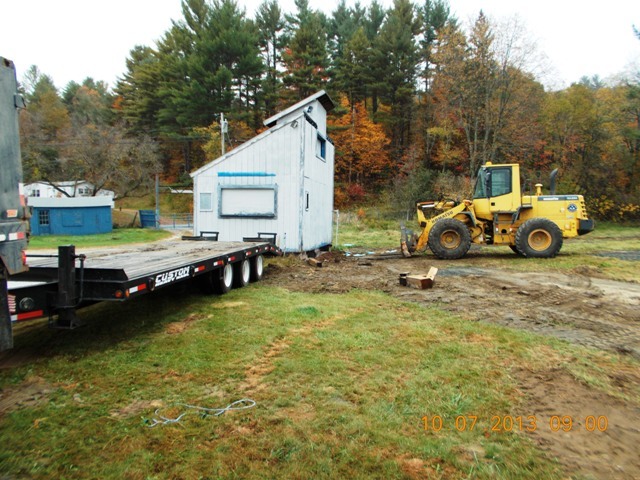 Bleachers donated by the Canaan MotorClub were transported to the football field at Mascoma Regional High School. The new Elliott Field received finish work and a sand pad for a trailer for a needy resident was created. The Autoware property was demolished for a new community parking lot. 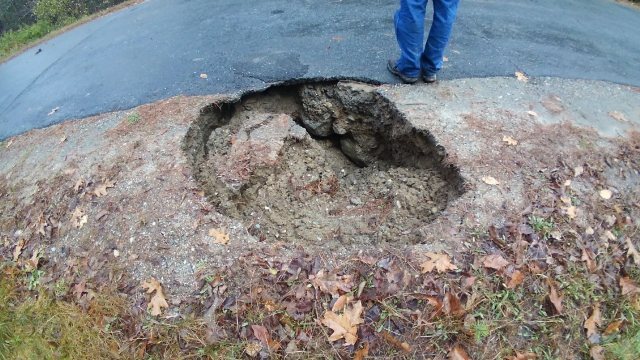 A water main under Indian River broke and was repaired by the Highway Department. A new (used) roadside mower was purchased in July and after it is restored at a cost of about double our usual annual rental cost. 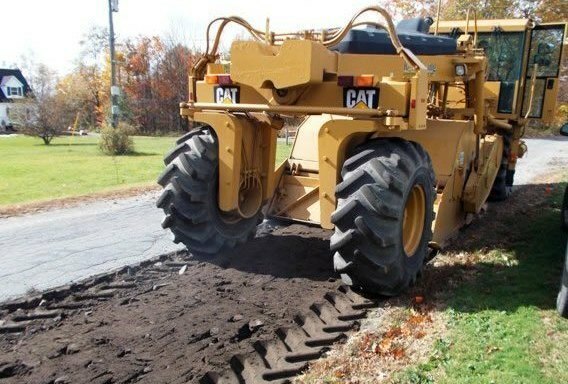 This will allow us to increase the amount of roadside mowing we will do in future years and save us money . We are hopeful that this year’s mowing will still be done before the end of fall. The delay is due to fixing the new (old) mower. And, as always, winter sand screening and gravel crushing was also completed. 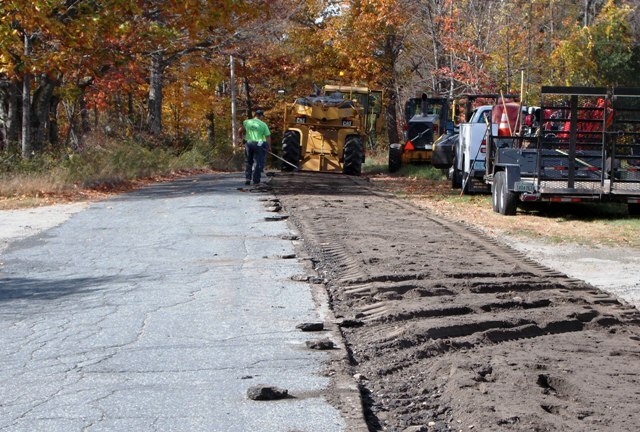 The Highway Department has spent much of the summer working on reconstructing about a half mile of Codfish Hill Road at the Turnpike Road end. In 2014 the pavement that had become impossible to patch was ground up. This year, a whole new drainage system was put in place. 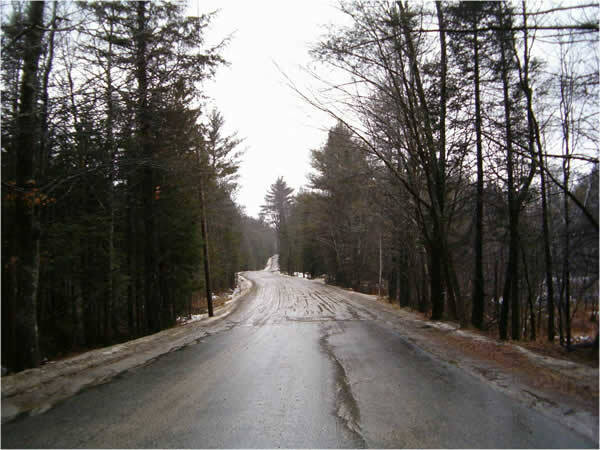 In past years, the continuous run-off from storms down the half mile long hill has been bad for the road, and in the winter it has created a lot of ice as the water repeatedly crossed the road. The new construction has created at least 8 new detention pits to capture the run-off from the road and let the storm water sink safely into the soil. 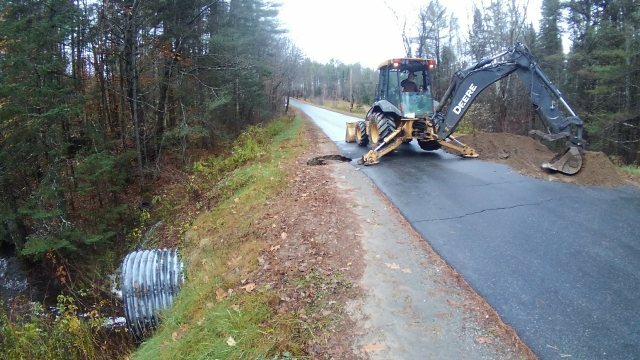 At least five new catch basins have also been installed as has many new culverts and nearly a third of a mile of new ditching with stone rip rap. 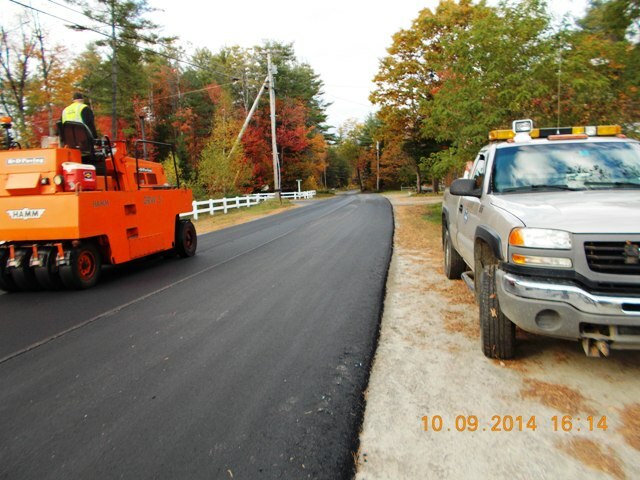 in October completed the Codfish Hill project. 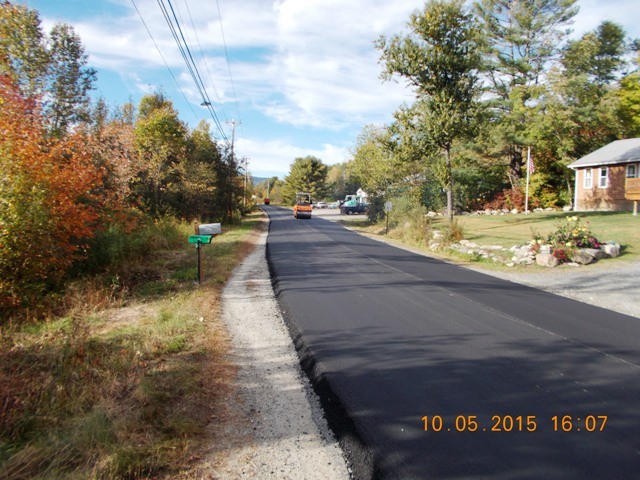 The other major paving project in 2015 was the completion of paving on Goose Pond Road. 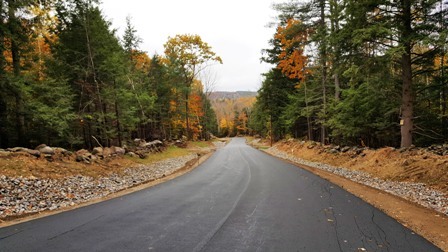 All of the worst sections between Route 4 and the Dam have been paved. 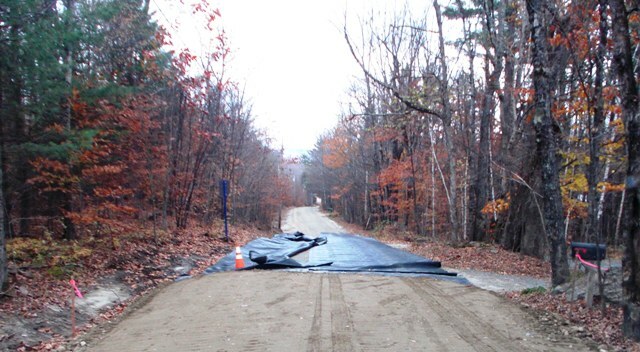 Talbert Hill will be paved in 2016. 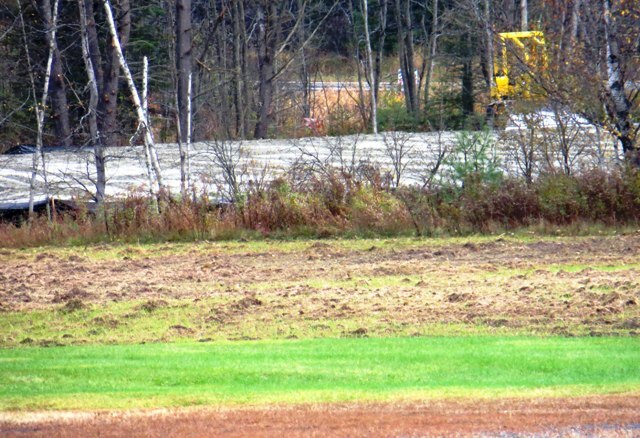 The Canaan Highway Department started work on relocating Elliott Field in October. 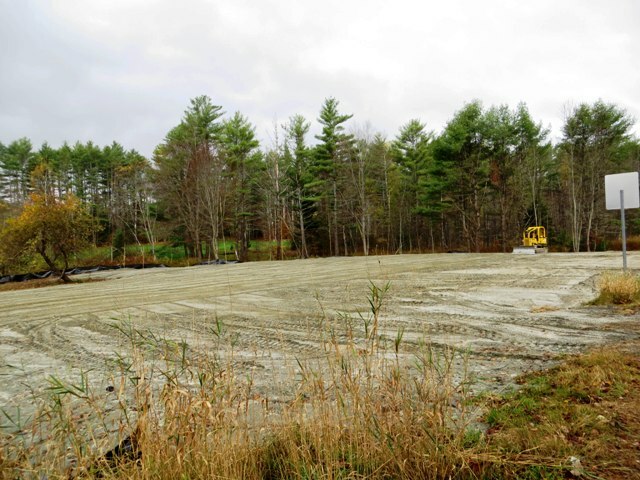 A large new parking lot was created to serve the new field off of Canaan Street. The ball field will be just over the brook at the end of the parking lot. 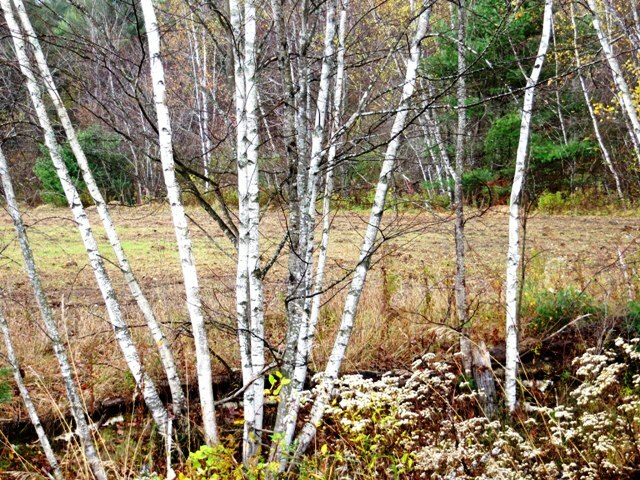 You can see the area through the trees that has been plowed up in preparation for installing the field in the Spring. The field will have lights, dugouts, and a scoring booth installed in the Spring as well. The money to move the lights was donated by Tillman Gerngross who purchased Canaan Speedway. Views looking from the field to the school, and from the school to the field. 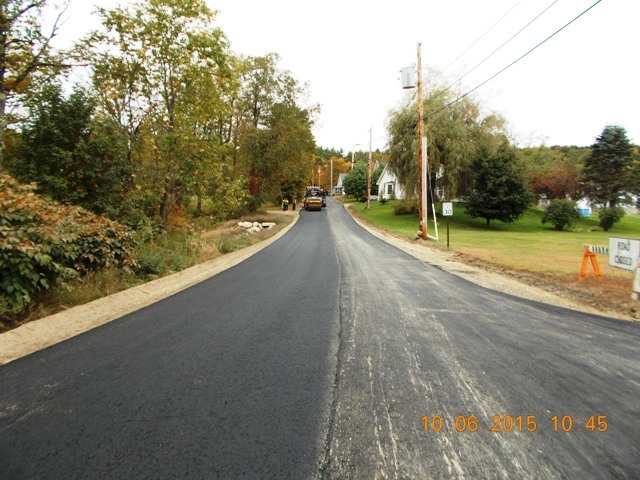 A little over a mile of Goose Pond Road was paved this fall, and a state brige replacement occurred near the dam. 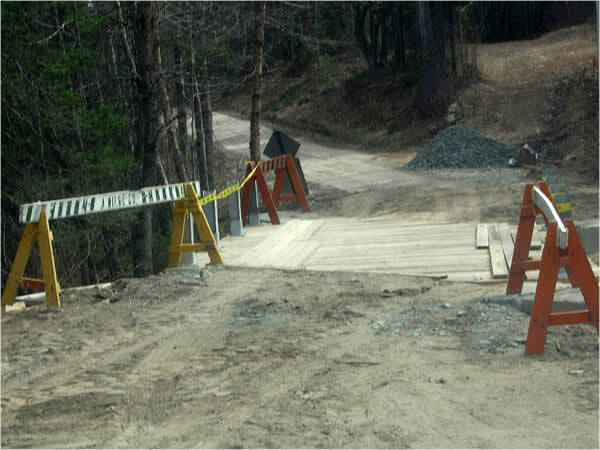 When the new bridge is completed that area will also be paved. 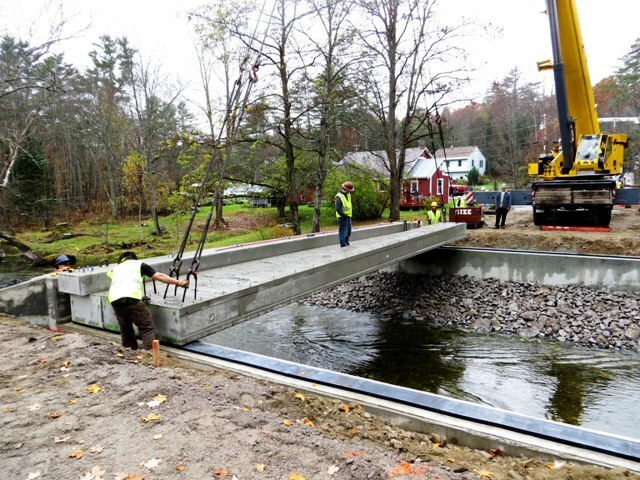 The concrete beams for the Goose Pond Bridge were set on October 22. 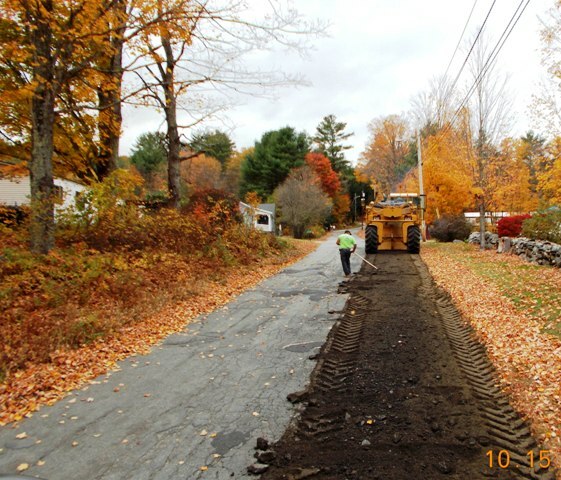 In conjunction with the Goose Pond Paving and Bridge, a reclaimation project on Codfish Hill Road and Talbert Hill Road was also begun. 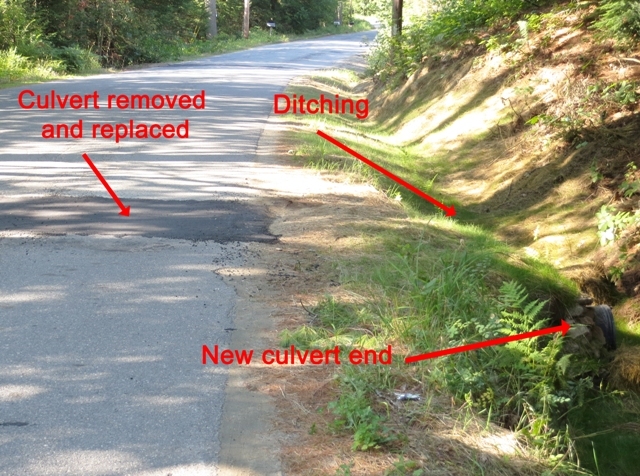 The left hand lane of the next photo shows how bad the asphalt had become on Codfish Hill Road. 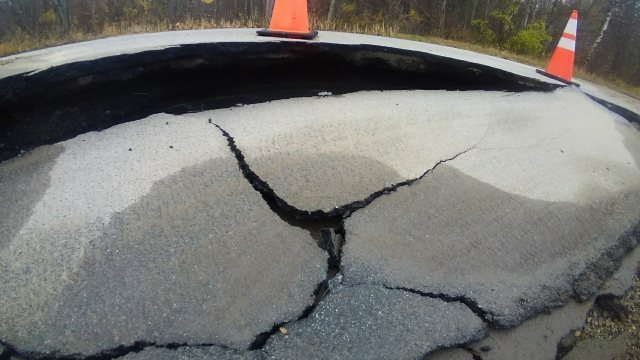 The pavement was cracked beyond repair. 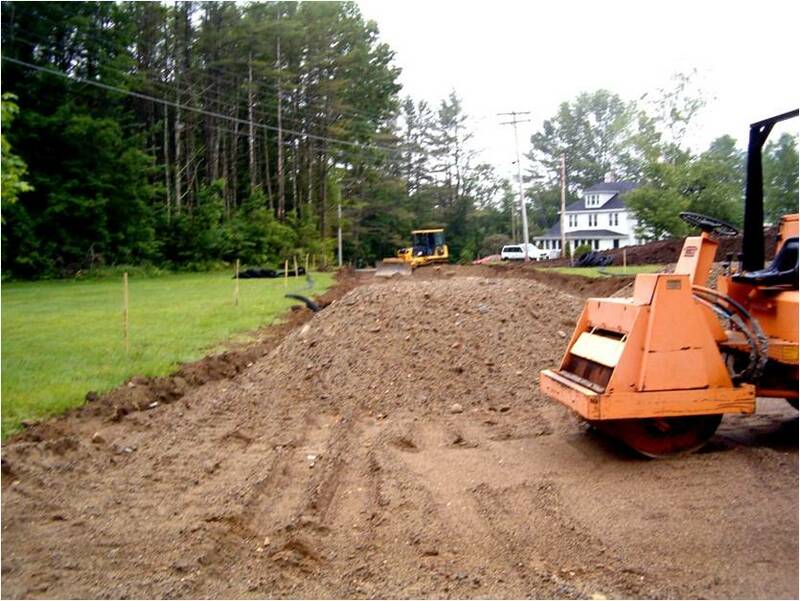 A large grinder is used to grind off the old asphalt and reset the material as ground asphalt base. 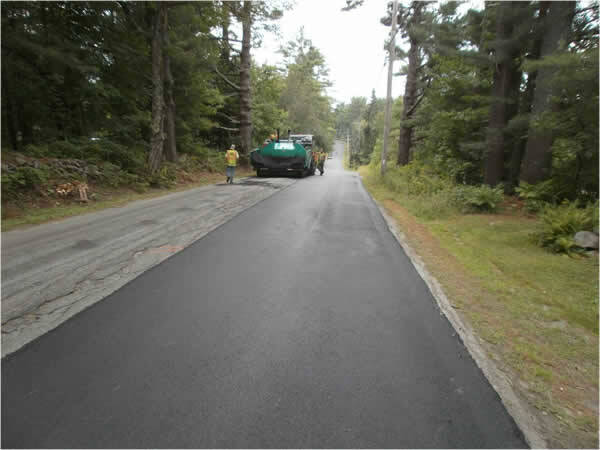 Additional ground asphalt is added to the material to shape the road and build it up. The final road is compacted for a tight base. The final paving will be completed in 2015. 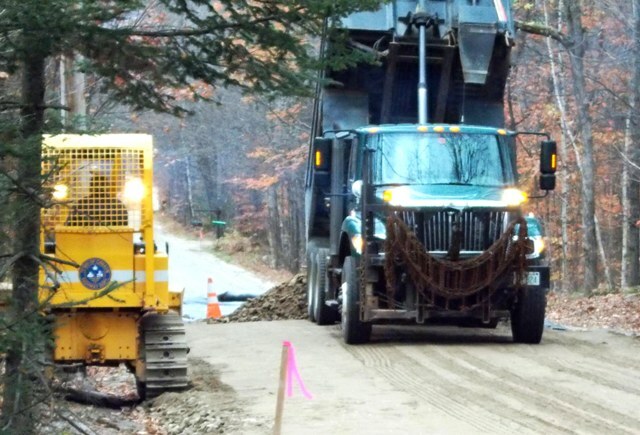 The Canaan Highway Department had three major construction projects that were part of the Highway Department and two that were part of other Departments in 2013. 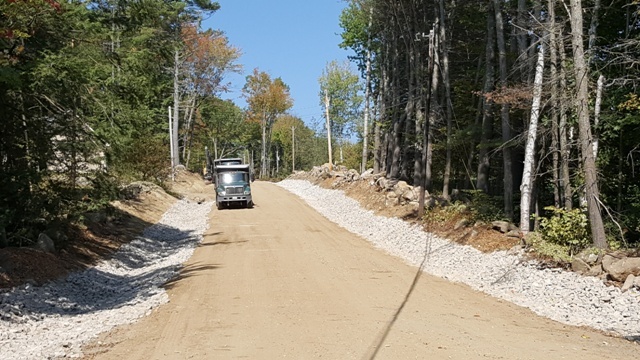 The crew worked extensively on Talbert Hill and Grafton Turnpike Road to prepare ditches for grading projects and then complete the grading projects. 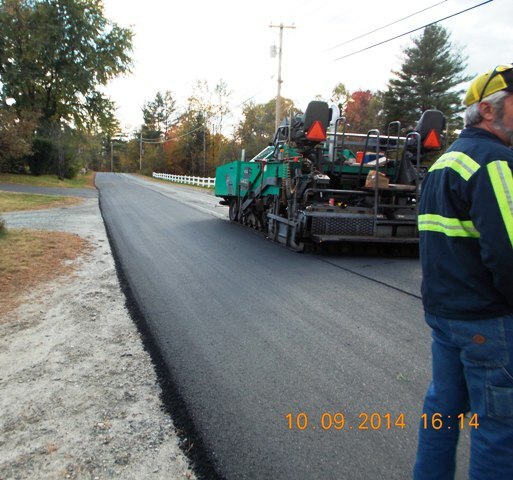 The shoulders were also dressed after the grading to keep the paved edges from breaking down. 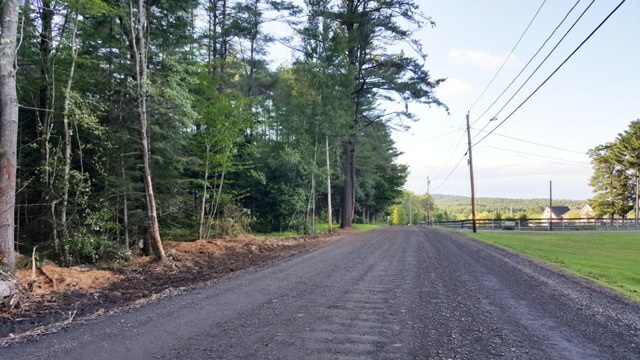 A major dirt road rebuilding effort was completed on Fernwood Farms Road. 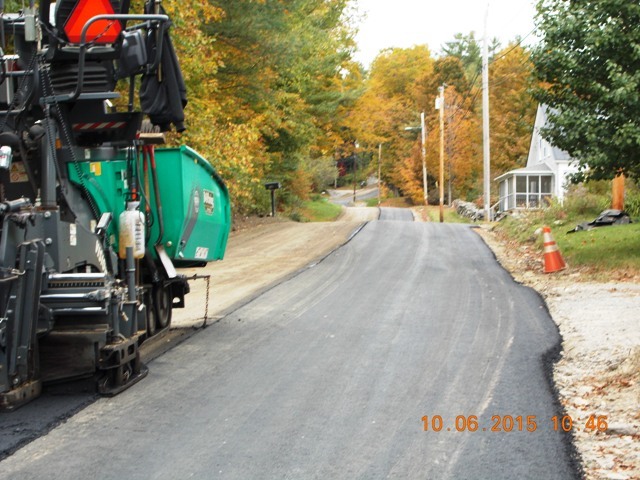 New ditching, road base, filter fabric and surface gravel was installed over nearly three quarters of a mile of Fernwood Farms Road. Currently, the crew are working to install stone drainage in the ditches and reshape shoulders to reduce ditch depth. 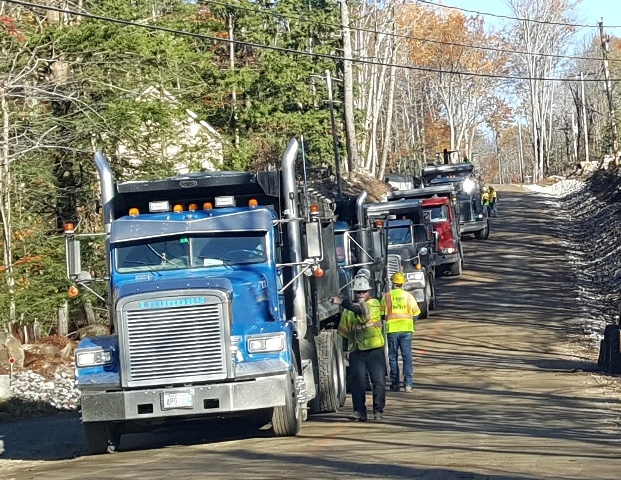 The Highway crew contracted out two weeks of service to the water system for the replacement of water lines on Highland Street and Follansbee Road. These two lines have had decades of poor water quality due to the old lines and the lack of blow out hydrants to keep the lines clean. 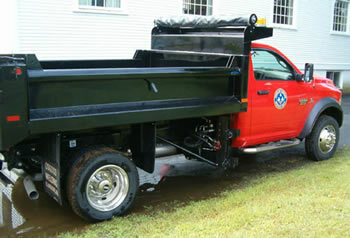 The cost of the crew and equipment was reimbursed by the Water Department to the Highway Department. 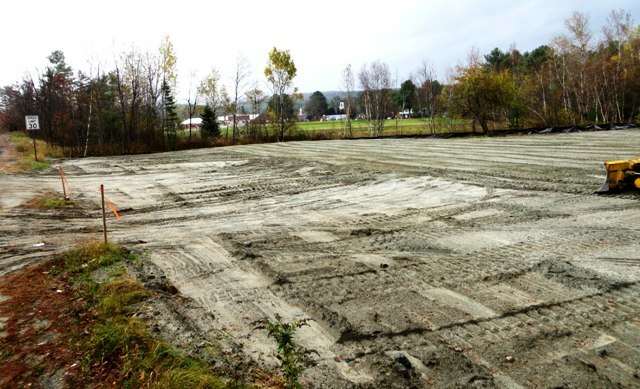 As part of the sale of Canaan Speedway, the buyer and the seller agreed to give the Elliott Field equipment to the Town for relocation to public property behind the Canaan Elementary School. 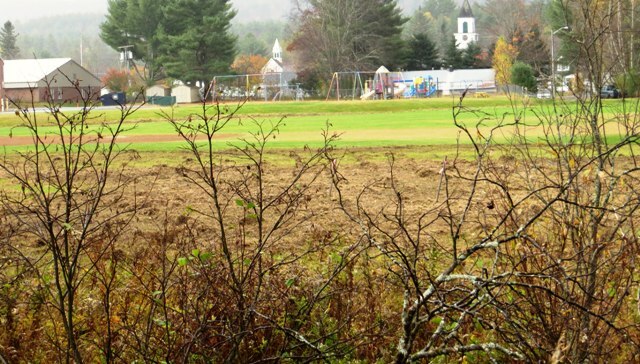 The buyer paid to reinstall the field lights and power and part of the fence installation but the Town had to remove all of the equipment and buildings. 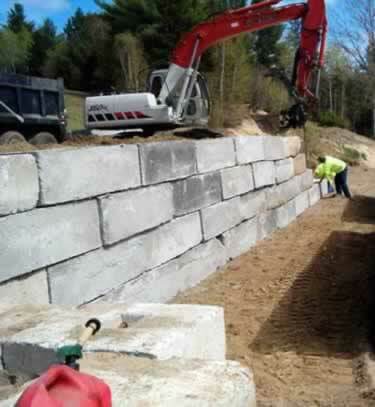 They were removed for the winter to the gravel pit and will be installed at the Elementary School in the spring. This project took about two weeks to complete. 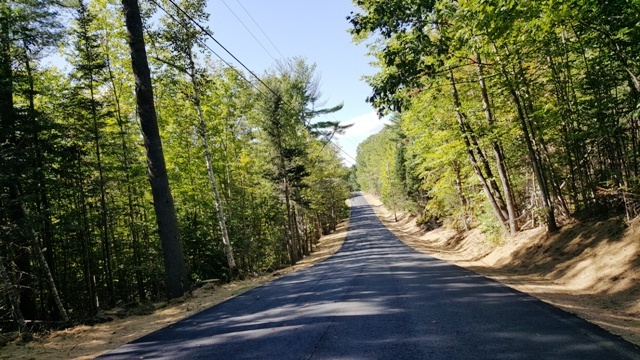 Highway also completed normal grading, culvert work, tree clearing and general maintenance. 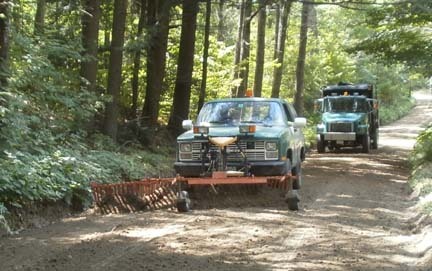 The later part of the season was handicapped by four trucks having significant mechanical breakdowns. Fortunately, the efforts of Bayne Stone returned all equipment to service. Completed! 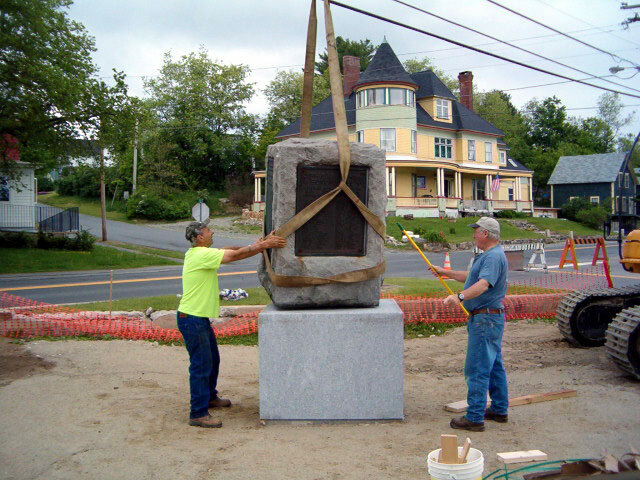 The monument in the Village was moved in time for Memorial Day 2012. The change connected the Veterans' Monument to the Village Common. 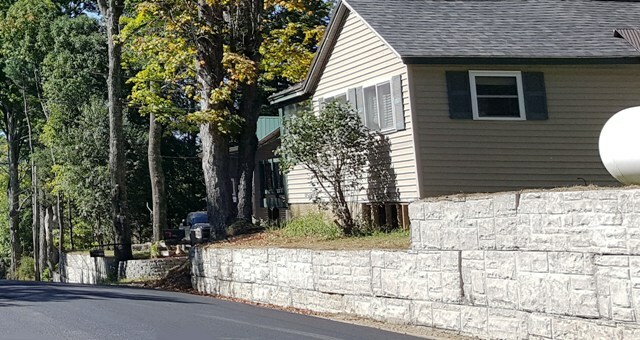 The move was approved by the voters in 2010, and the effort to complete it was a joint project of the Canaan's Weld-Webster American Legion Post 55, VFW Post 9552 of West Lebanon, the Friends of Canaan Village and numerous local contributors. 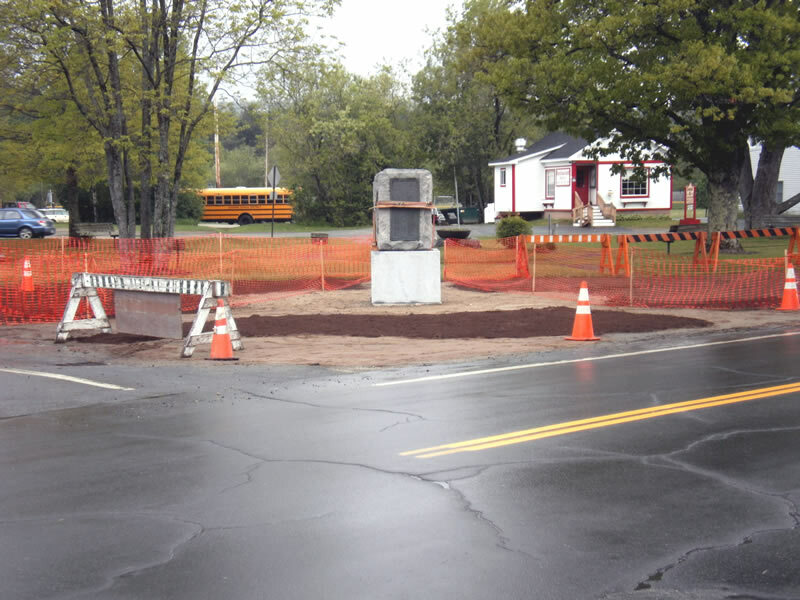 The Highway Department removed the old road, reseeded the area reclaimed, prepared the monument and walkway base and moved the monument. In its new position the roster of people who have served is more easily visible for all..
By the end of September, the Back Bay bridge was completed, the road paved, and the guard rails installed. 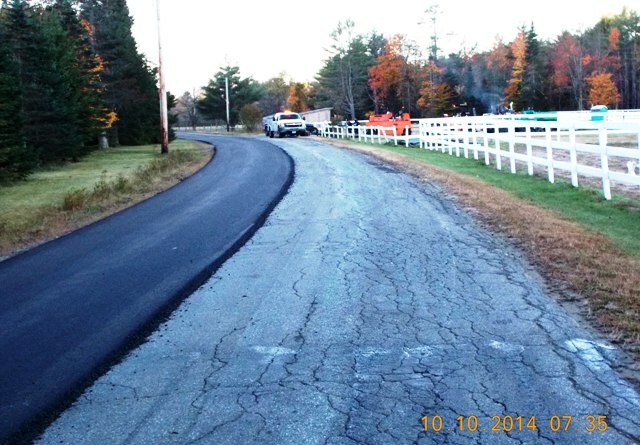 This project was significantly less expensive by having the majority of the work completed by the Highway Department. 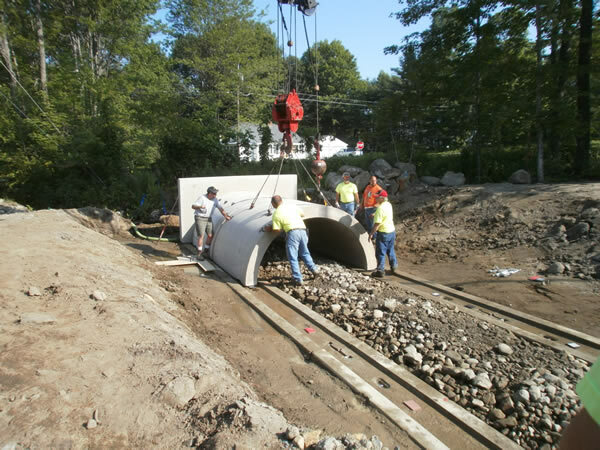 The precast concrete culvert sections (shown in the picture) reduced construction time and engineering expense. 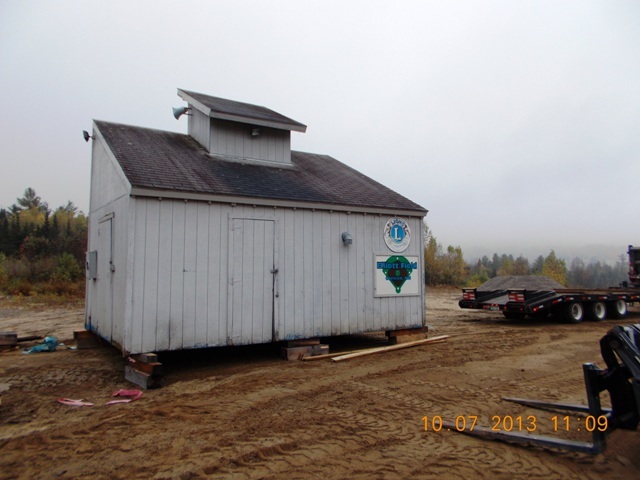 The Town Highway Department salt shed has been completed in the Town's gravel pit. 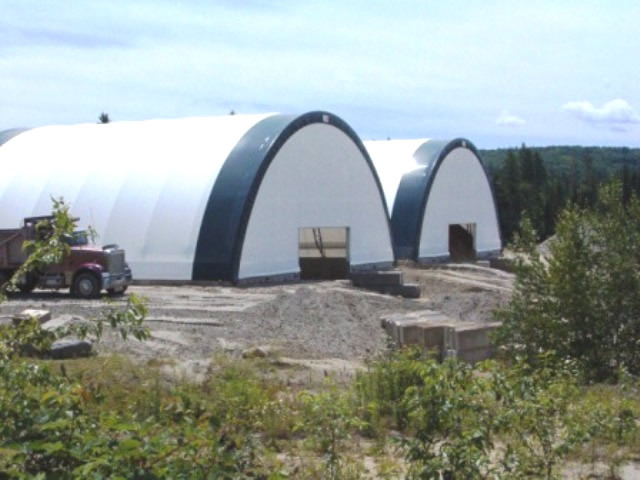 The new facility is made up of two large fabric structures that protect our winter sand and salt from snow and freezing water. The shed on right is used to store all of our winter sand which you can see in one of the photos taken from the back. That sand pile is well over 20 feet deep inside of the shed. 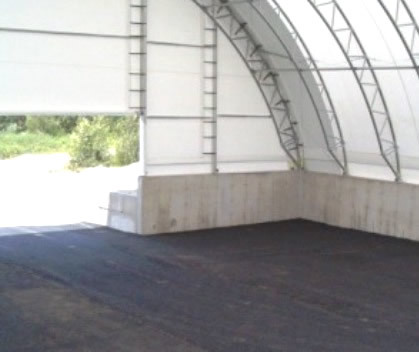 The shed on the right is used to store salt and will be used as a protected space to mix the dry sand and salt together before applying the mix on the roads. 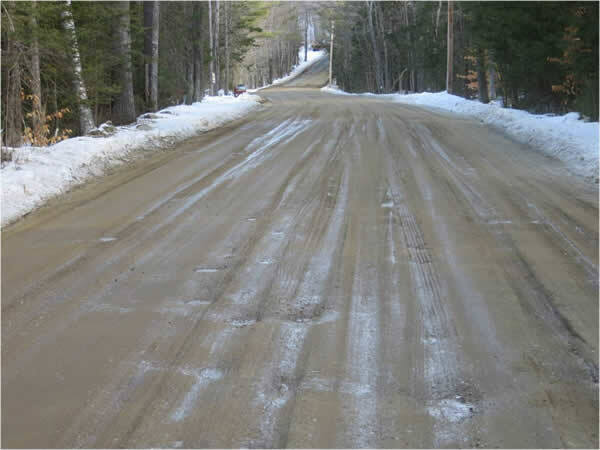 This process should reduce the amount of salt used and keep the sand from freezing into large clumps that will not pass through the spreaders. The shed will also reduce water pollution from rain running off the salt pile and bring us into compliance with state and federal law. The total cost of this project was more than $120,000 with the major share coming from FEMA repayments for repairs after Hurricane Irene. 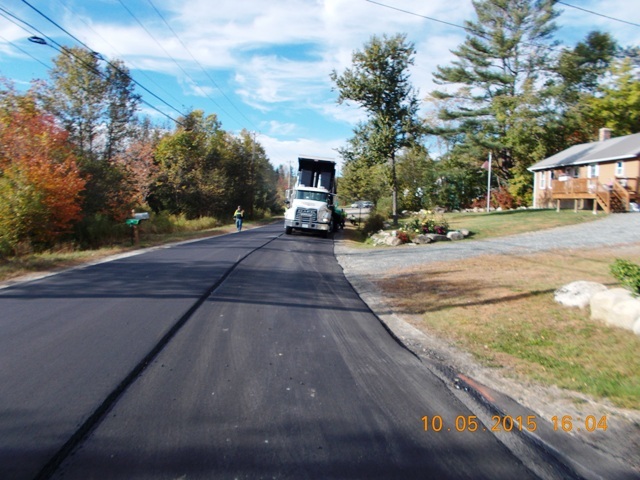 The cost of paving doubled over the past two years. As a result, additional money will need to be dedicated to paving next year and we will only be able to repave a half mile this year. 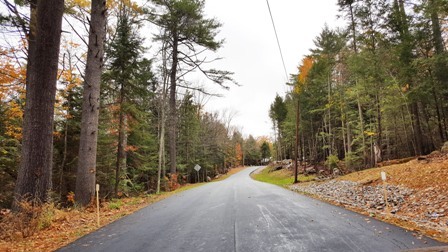 The stretch that is to be repaved this year is half of the Turnpike Road that was reclaimed (asphalt ground to redo the broken pavement) two years ago. A half mile of new paving in that location will cost $92,000. 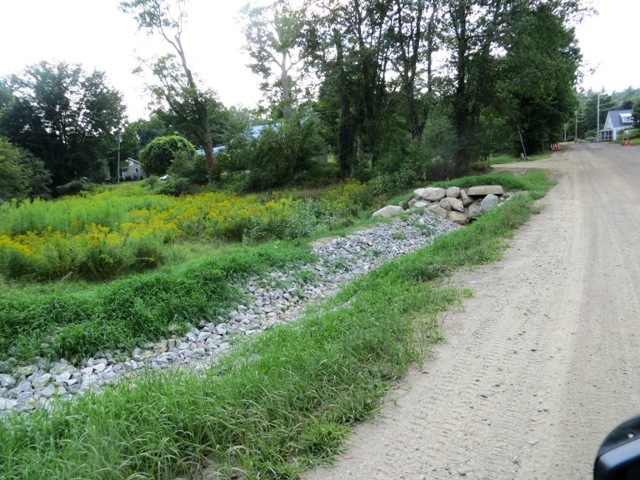 Additional money will be spent to pave the area related to the new Back Bay culvert. 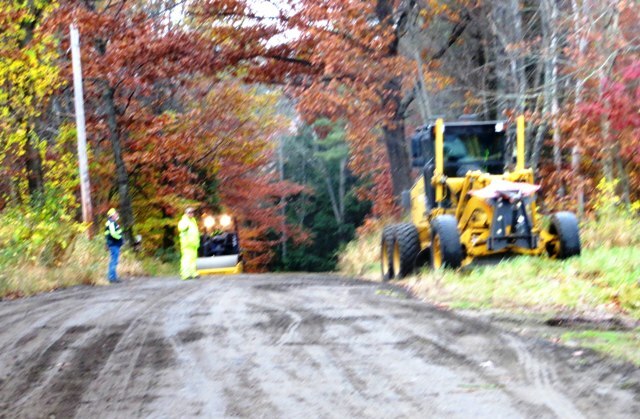 Traditional dirt road work will continue. 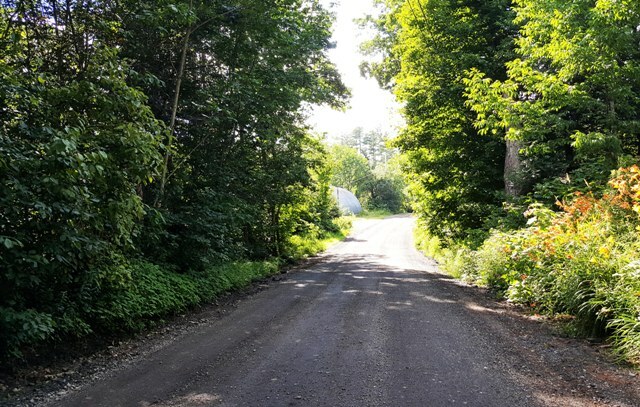 Ditches will be improved, culverts will be replaced, signs repaired and replaced, trees will be cut back to allow sun to dry out the roads, roadsides will be mowed, roads will be graded, and dust control will be applied. 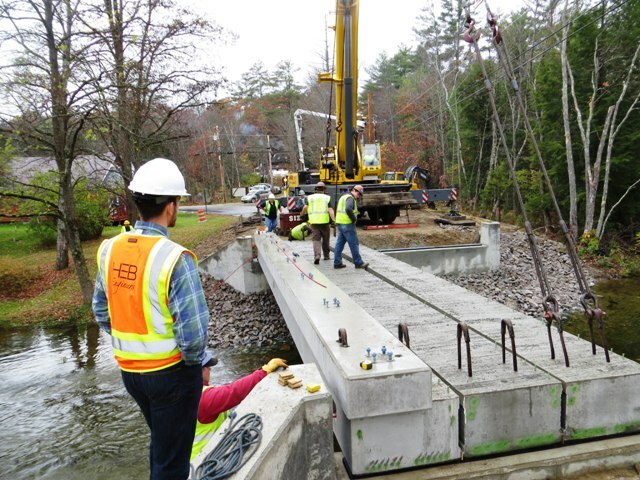 The Town of Canaan has 12 bridges that are large enough that they are inspected by the State every year and receive an assessment of their quality. There is a red list that is created by the state that lists bridges which have a structural issue that needs to be addressed but which usually does not prohibit the use of the bridge. On these bridges, the state provides funding of 80% of the cost of the repairs or replacement, although the waiting list is currently over 10 years. We have two bridges on the red list. 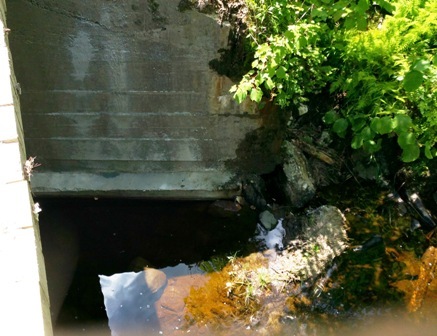 There is a set of culverts on Goose Pond Road just below the dam that are rusting out. 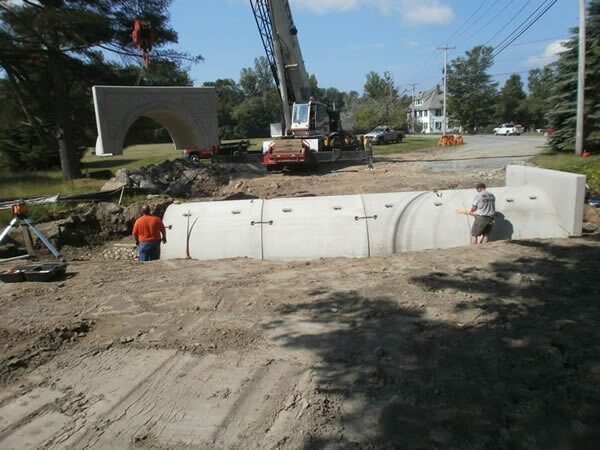 The total replacement cost for these very large culverts is about $500,000 including engineering. 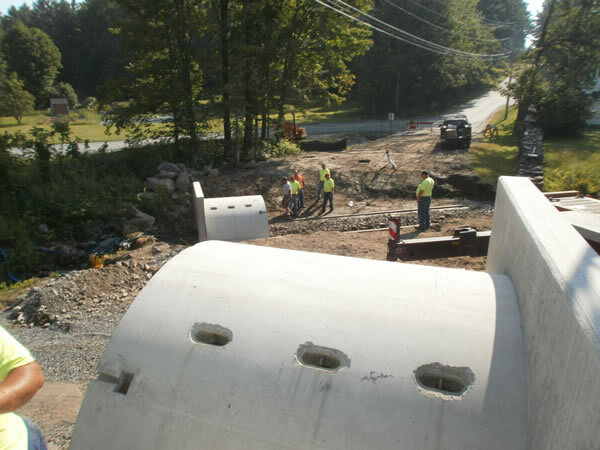 The Town replaced these culverts in 2014 using 80% state funding. The first red list bridge to be replaced is the bridge that crosses Indian River on Potato Rd. The issue on this bridge is that the wooden decking needs replacement. This is scheduled for replacement in 2019. 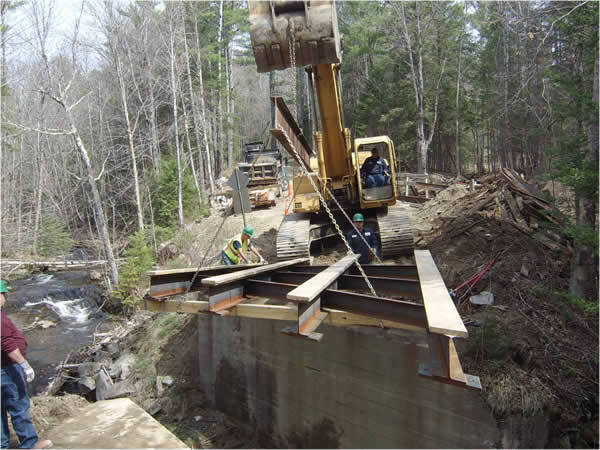 We currently have sufficent funding for the 20% local share of the cost for replacing this bridge. The second red list bridge is the first bridge crossed as you enter Grist Mill Hill Road from Route 4. The issue on this bridge is that the concrete decking is leaking water that is allowing rust to form on the steel I-beams. Our plan is to reconstruct this bridge by 2023. 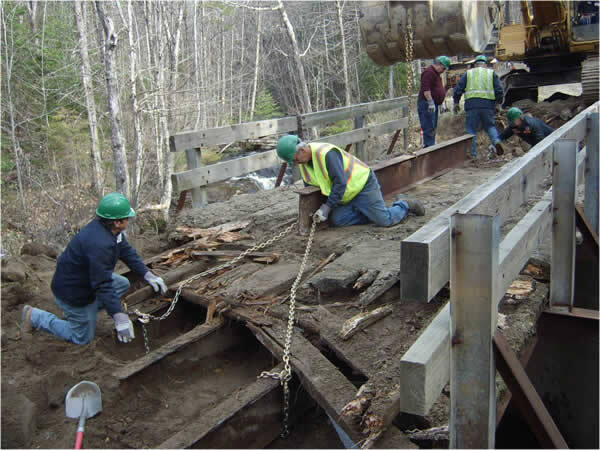 We maintain a capital reserve account for the local share of bridge repair and replacement. 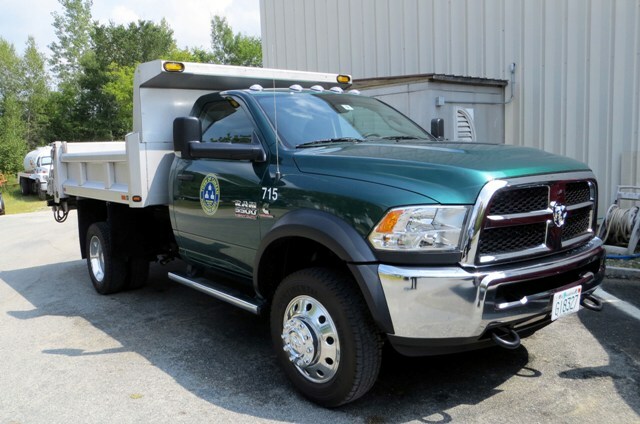 The Town bought a new Dodge 5500 dump truck to replace one of the smaller 1 ton style dump trucks. The new truck is a replacement for the 2005 GMC truck. 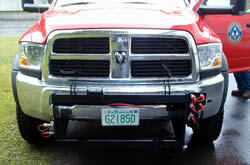 The Dodge was selected because of the improved strength of the frame as compared with the GMC. 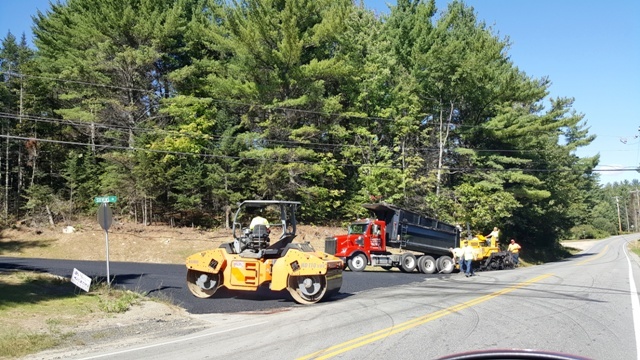 The Highway Department was able to obtain several pieces of equipment through the CIP Program, Capital Reserves and Year End Surplus. 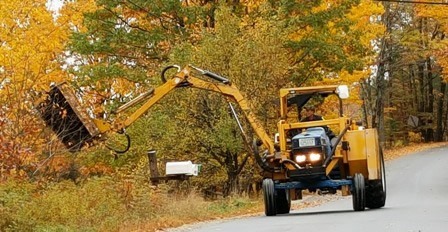 The largest expenditure was for a backhoe to replace the 2004 JCB backhoe. 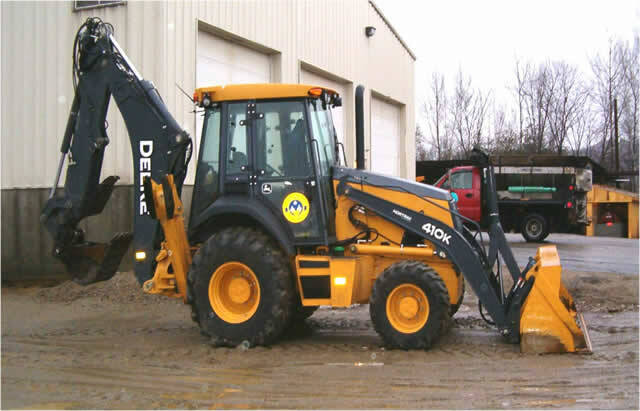 The backhoe is used extensively for culvert, water & sewer and construction work. 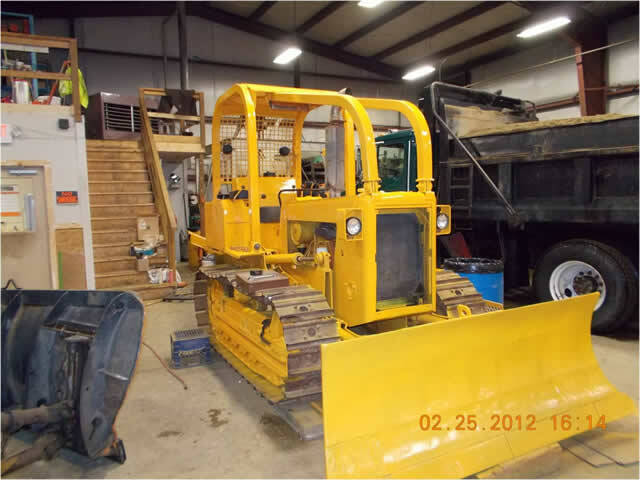 Also added was a "new to us" used bulldozer that was rebuilt by our mechanic. The bulldozer will save us at least $5,000 a year. Finally, we sold our old equipment trailer and bought a larger trailer than can carry the excavator we use. 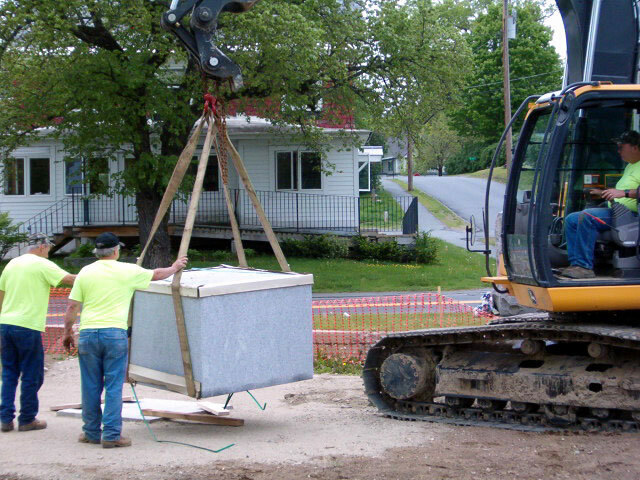 The trailer and backhoe were funded from the Capital Reserve we put aside each year. 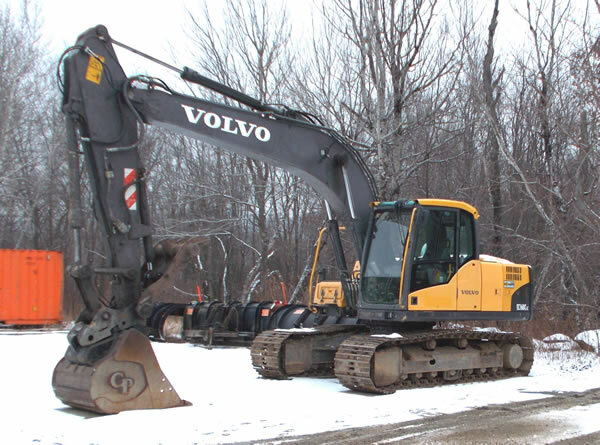 The bulldozer was purchased from unexpended highway funds at the end of 2012. 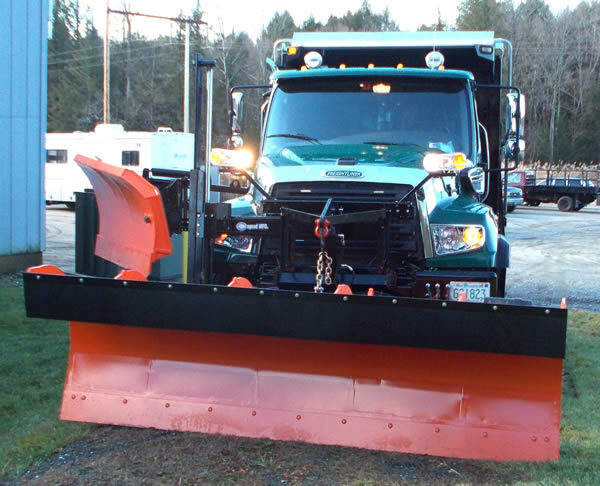 The front snow plow has a quick disconnect the lifts and attaches the plow for winter use. 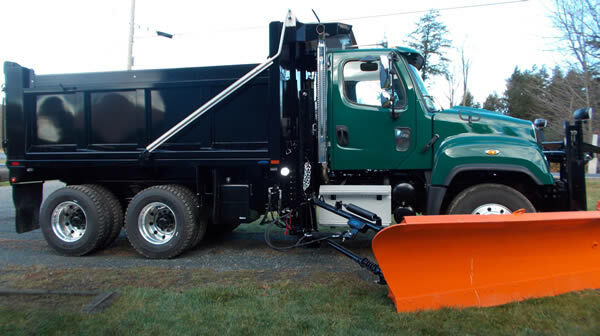 The wing plow that attaches on the passenger side of the truck has a quick disconnect that lifts the wing plow and attaches it to the side of the truck. 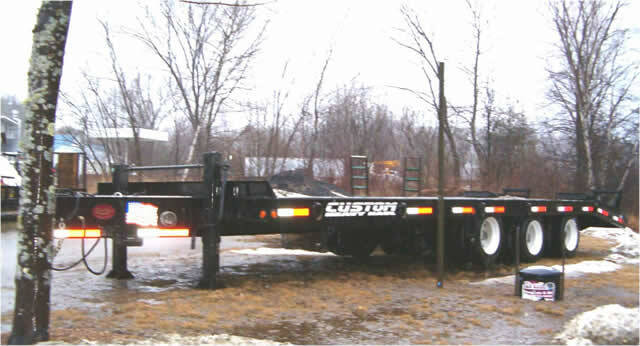 The dump box sides fold down if needed to use the dump body as a platform for tanks or to carry oversize loads. 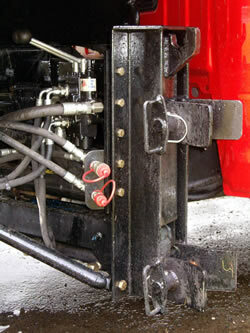 All hydraulic controls including the attaching of plows are located in the cab. 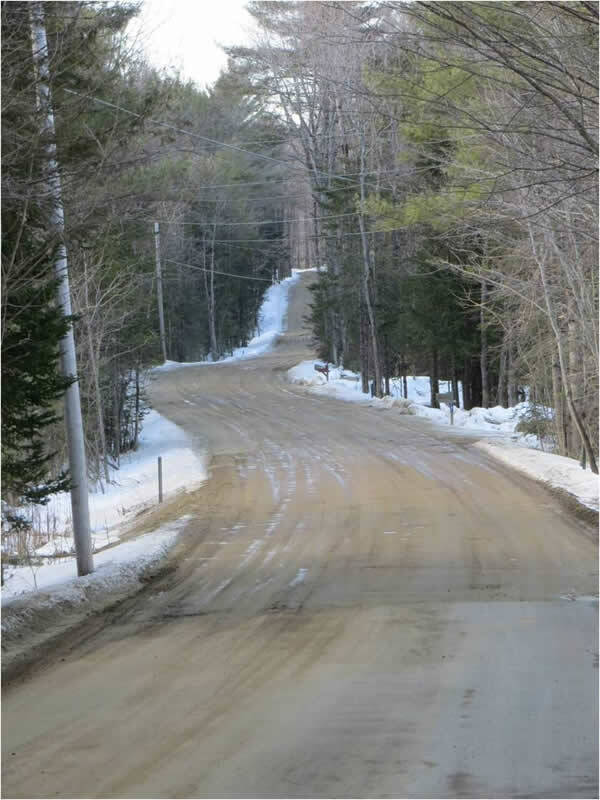 • Winter Sand is available seasonally for residential use. 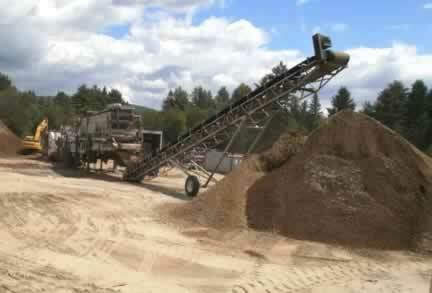 The sand is intended to be used by the bucket and not by the truck load. 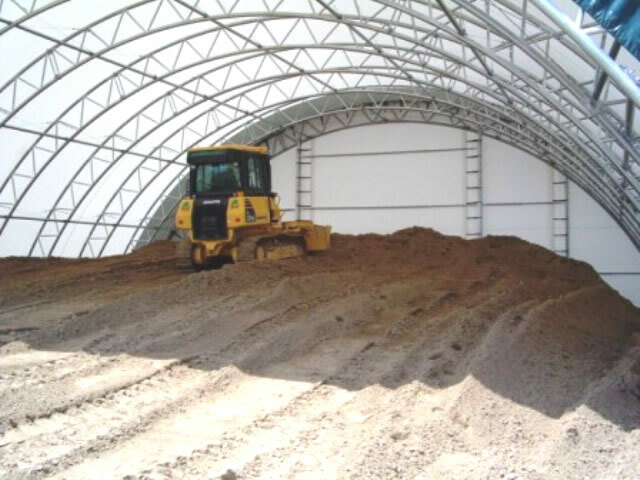 Misuse of the sand pile could result in limitations of elimination of sand provisions. 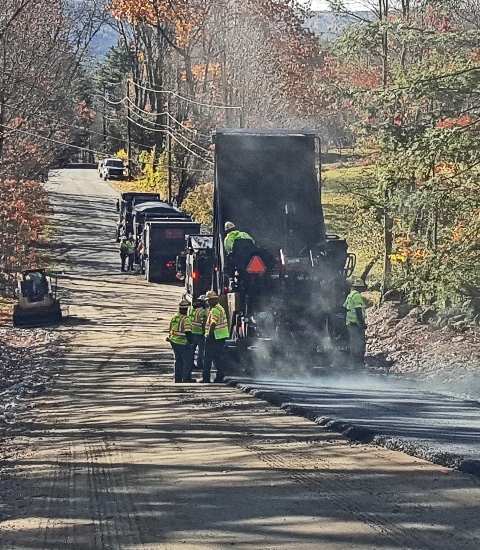 The Highway Department is willing to deliver free fill from road projects if people request it and sign a waiver of liability on the delivery and use of the material. Call Bob Scott at 523-4344 to request the fill and download a waiver form here.